In Hindu religion, Aadi Shakti Durga is the greatest in all goddess. According to mythology, it is said that goddess Durga blesses all the people with happiness in this world. By worshipping Durga, devotees can full fill all their blessings. 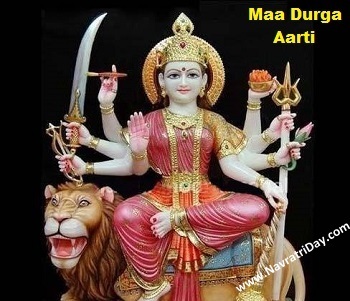 During the worship of maa Durga in Navratri, devotees recite many mantras, bhajans and sing aarti to praise Maa Durga. Here we are presenting goddess Durga Aarti in Hindi and English.